The Fine & Country Gold Cup celebrated its 10th anniversary in style on Saturday 7th July 2018, raising £2,386.12 for homelessness. Crowds gathered at Dallas Burston Polo Club in Leamington Spa, Warwickshire and walked across the grounds to their favourite picnic spots with the best views of the polo. 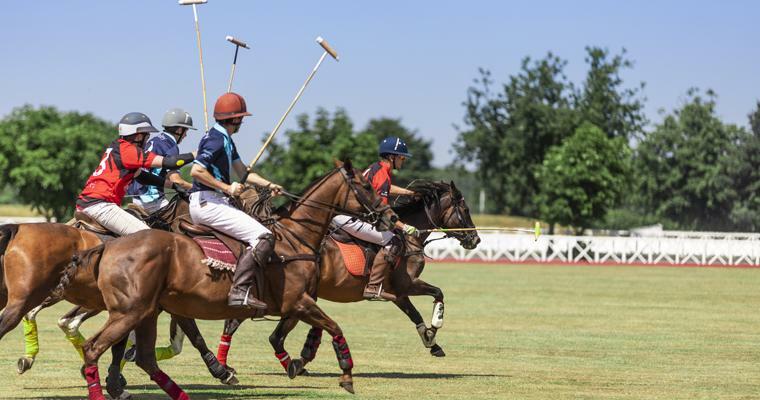 The polo players rode across the pitch with amazing ease, making the game look almost effortless. The polo ponies were kept cool and hydrated throughout the day and were not allowed to play two consecutive chukkas for their welfare. The commentator helpfully explained the rules of the game for first-time guests. The coveted Fine & Country Gold Cup was claimed by C.A.N.I., who stormed to victory in a captivating match. Exhibitors were busy all day selling refreshing gin, stunning jewellery, unique accessories and much more items. Stunning vintage and new super cars were on show from guests of Dr Burston, owner of Dallas Burston Polo Club. The World Cup met the Gold Cup as screens were delivered across the polo grounds for England fans to watch the quarter-final. Spirits were high from the excitement from the polo, beautiful weather and England’s victory. For the first time, the event was held on a Saturday. To mark the occasion, an after-party was held for VIP guests. The live band, Sugar Rush, kept guests dancing into the night. Thank you to everyone who joined us to celebrate the 10th anniversary of the Fine & Country Gold Cup. Keep an eye out for details of next year’s event, which will be revealed soon. To support The Fine & Country Foundation’s mission to relieve the causes of homelessness, please donate here. We will distribute funds in our October grant programme. Find out more about the grant scheme here.